Raft Building involves participants working in small teams against the clock and each other. With limited equipment the aim is to build a raft strong enough to carry the whole team and race round a water course. Whether your looking for Team Building or a fun activity, Raft Building really does tick all the boxes, from planning and prioritising to communicating and constructing. Regardless of your reasons we guaranteed you’ll get wet and have a great time!! 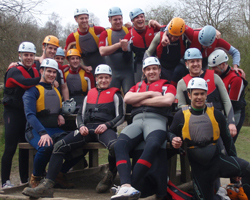 Raft Building and Raft Racing are fantastic team building activities for any type of group. We deliver raft building from locations all over the UK. Raft Building is perfect as a half day activity or part of a full day team building event. We provide everything you need to try raft building including all necessary safety equipment. Just wear some comfortable outdoor clothing and suitable footwear. 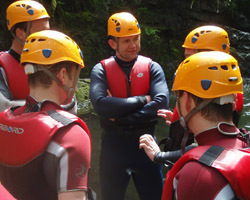 Raft building is perfect for corporate team building, building skills in teamworking, planning, prioritising, communicating and problem solving. Raft Building is a fun activity for stag weekends, racing against the clock and your mates to build and race a raft which will carry your team to victory. Hen party groups will enjoy this wet and wacky adventure activity. Working in small groups to build and race a raft with a few basic materials. Raft Buiding is a great activity for young people. It is outdoorsy and fun while still instilling the principles of communication, teamwork, planning and problem solving.